Electric arcs are a discharge of electricity resulting from an electrical breakdown of gases in the air. Electricity flows through the arc between two points called electrodes, producing a plasma that can sometimes be visible. Both the electric current and the electrodes in this case are referenced as an electric arc. It is important to note the difference between an electric arc and an electric spark; the former is a continuous discharge of electricity while the latter has a momentary discharge. There are two types of electric arcs to be aware of in the workplace: controlled and unwanted. Electric arcs have long been harnessed and used for a variety of applications beginning in the late nineteenth century when the first electric street light utilized electric arc lighting. Today, the heat from controlled electric arcs are used in welding, plasma cutting, and certain kinds of chemical analysis. Furthermore, electric arcs have been used in movie projectors, stage lighting, and steel-producing furnaces. On the other hand, unintended electric arcs have the potential to be extremely dangerous to both workers and the facility. 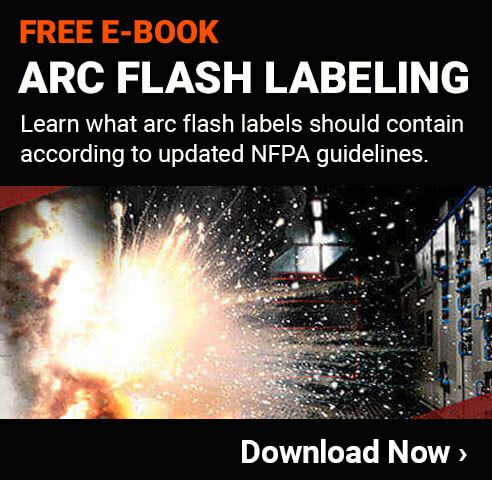 Arc flashes occur when the heat and light produced from an undesired electric arc is supplied with a high enough voltage to cause injury or damage. It is a type of electrical explosion that can produce a blinding flash of light, deafening noises, and enough pressure to cause a concussion. Workers are at serious risk when it comes to arc flash as it has the potential to cause severe burns, electrocution, and in some cases death. Additionally, an arc flash can create temperatures hotter than the surface of the sun, start fires in the immediate area, and the blast itself has the ability to shatter windows and splinter wood. When it comes to electrical safety in the workplace, it is important to assess the facility’s risk and provide the correct protection for workers. Employees must be properly trained on the procedures for working in energized environments and what the dangers entail. A LOTO program will need to be put in place, safety visuals posted in the area, and the appropriate PPE provided.